The Modern Quilt Guilds across the US were given a challenge by Robert Kaufman fabrics to create a solids only quilt made from a Kona fabric charm pack given from Robert Kaufman fabrics! Who doesn't like free fabric?! So the quilt now has become a nice lap body length quilt for laying on the couch in the living room. Started with taking each charm square and sewing it to a random strip of Kona Coal grey.. I did this for all 30 charms. Then sewn two charms side to side, with the grey on the outside. Sewn all 15 rows together. Then trimmed off the excess on the grey strips. And added two long grey pieces, to add more grey to the sides.. 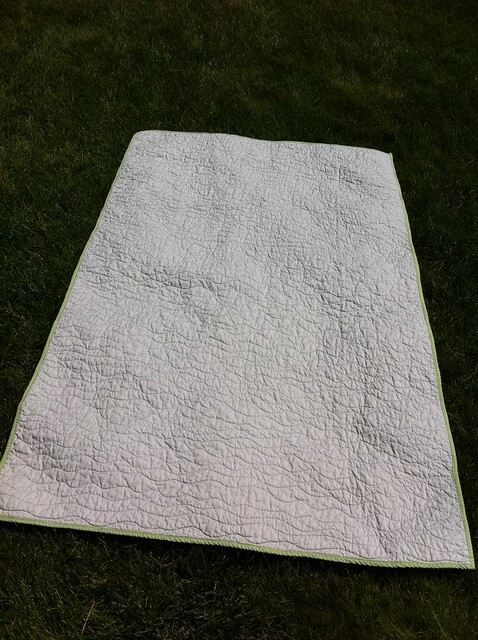 This was my first time using spray adhesive for sandwiching the backing, batting, and top of the quilt together. It was really quite easy and will probably do it from now on! I did just a simple wavy pattern for the quilting with my walking foot..
And here it is with all the stitching done on it, with detail pic too.. I pressed it in half and sewn it on.. So I put in a large stitch that would be easy to go back and take out, when if I found time to do the blind stitching. And here it is just after completing it in my sewing room space, in my basement..
Of course I had to take it outside after its first wash and dry.. The back was just a solid Ash Grey.. no time for a pieced back.. Thanks for reading my Kona Solids Challenge process! 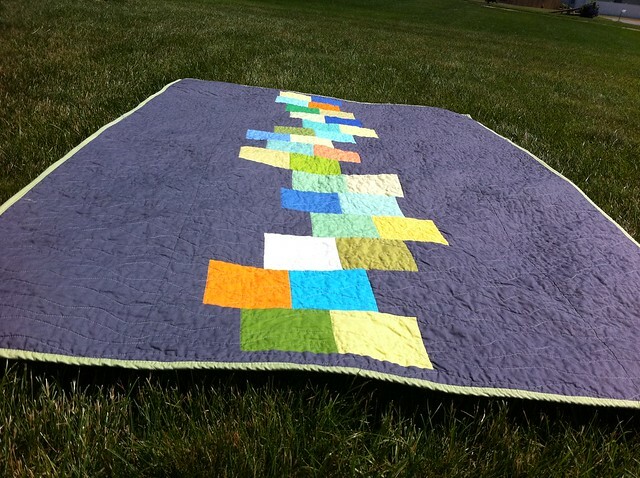 You can check out the other quilts done by my other guild members at Ann Arbor Modern Quilt Guild HERE! I love how you quilted it! Totally inspired me for a quilt I am working on now! 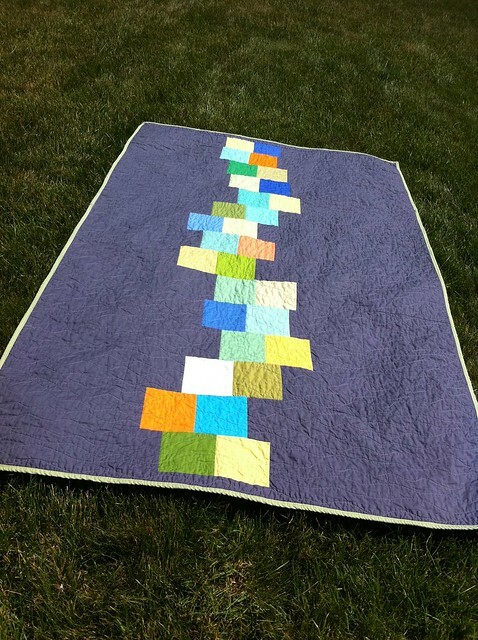 Such a great fun, fast quilt! Love the quilting too. Super cute! I wish I could do that!